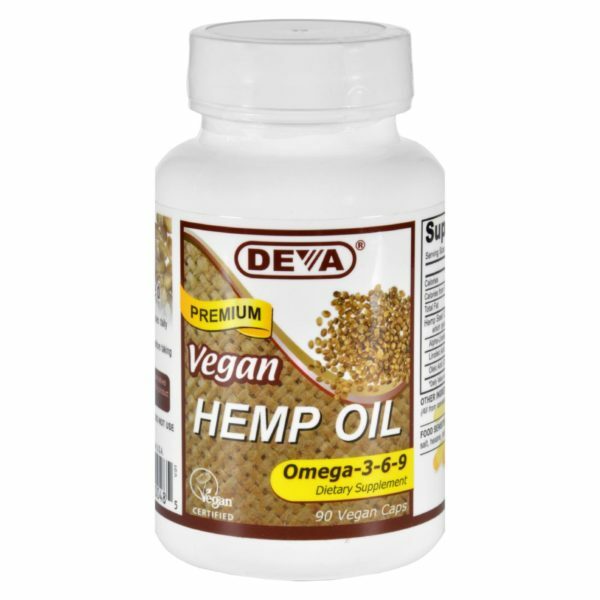 Deva Hemp Oil Omega 3 6 9 is a popular oil commonly used in dietary supplements, cosmetics and culinary applications. Basic research suggests that hemp seed oil gets its health benefits from its high fatty acid concentration, antioxidants, vitamins and phytosterols. In particular the fatty acids alpha linoleic acid (omega-3), linoleic acid (omega-6) and oleic acid (omega-9) carry much of the health benefits in hemp seed oil. Hemp Oil’s fatty acid profile appears to be well balanced for human nutrition (~3:1 la to lna ratio). The Hemp seed oil used in our product is organic, cold-pressed and unrefined. It also comes in vegan capsules that are made from plant cellulose instead of the commonly used gelatin. Deva Vegan hemp seed oil is 100% animal free, and guaranteed for purity, freshness and labeled potency. Remember all Deva products are 100% vegan, vegetarian and are certified by the vegan society, the non-profit organization that actually invented the word “vegan”. * Information and statements regarding dietary supplements on our website have not been evaluated by the food and drug administration and our products are not intended to diagnose, treat, cure, or prevent any disease. Individual results may vary.